Documenting TA. Existing praxis in the established Parliamentary Technology Assessment institutions will be described by pairs of PTA and non-PTA partners in order to create common knowledge on the state-of-the-art in knowledge-based policy-making. In parallel, a catalogue of potential work modes for developing a cross-European praxis of PTA will be established and a book on Technology Assessment gathers the insights and will be published on the Internet and printed. Training TA. A Summer School will be held two times with users and actors as target group (scientists, stakeholder, civil servants, MP/MEPs, etc), in order to facilitate the mobilisation of PTA functions in their home countries. Four Practitioners’ Meetings will be made, at which PTA project managers are training newcomer project managers on scoping and framing issues; methodology; networking and impact creation; and communication. A TA Portal will be established presenting content of TA websites, training material from the summer schools and practitioner meetings, and web 2.0 facilities for professional e-debates. Debating TA. Debates in the non-PTA partner countries on the prospects of institutionalizing PTA will be facilitated on the basis of an investigation of the historical, political and cultural foundation for such a development. Two rounds of Parliamentary Debates between science and technology committees of European parliaments will be created – the first about the documentation of PTA in Europe, and the second after the abovementioned non-PTA country debates. Two European Conferences on TA will be made, with a two-track programme in order to facilitate the meeting between PTA and the potential users in newcomer countries. The first track is topical and will engage stakeholders and policy-makers in highly topical discussions around “grand challenges” for Europe. The other track is professional and will provide a workshop program on TA and TA-like methods and activities. A European magazine, VolTA, will be published 8 times during the project, each giving a topical presentation of issues of relevance for knowledge-based policy-making, and abstracts and a synthesis of PTA projects on the topic. 3 cross-European example projects. The three main methodological clusters in PTA – expert based methods, stakeholder involvement, and citizen consultations – will be exemplified by cross-European projects. Each project will be coordinated and synthesized at the European level, based on sub-activities at the national/regional level. The issues were chosen as key science and technology issues of the “Grand challenges for Europe” of the Lund Declaration, and will be “Public Health Genomics”, “Ageing Society” and “Sustainable Consumption”. PACITA will mobilise a wide range of actors in at least eight European countries, which do not have a structured or institutionalised approach to knowledge-based policy-making on topics with a prominent aspect of science and technology. 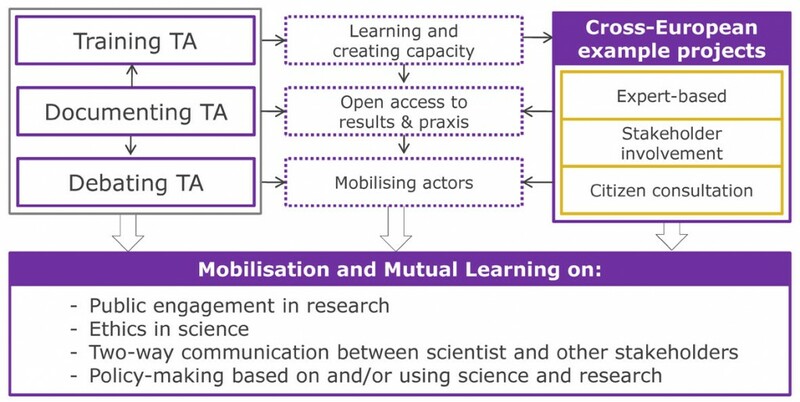 This mobilisation will be two-way, in the sense that it will make policy-makers aware of the potential and prospects of establishing structures/institutions that can professionally facilitate the use of knowledge and evidence in policy-making, and it will ignite an interest from the side of science and research to involve themselves in the societal and policy-oriented processes that gives rise to policy-making.